Go Kev , they are very realistic , I agree with Bob the brown ones are nearly right on the money Regards Pete. They do look good mate, I have been looking at these on the internet, Ive been collecting frogs of all types for a while, have got them from all over the world, some are so real its amazing they dont croak, hope to post photos soon as i can work out how to do it. Ive saved info on many of the sellers, so will pass that on to anyone interested in froggy things. I Plan on a frog only fishing trip up to Awoonga dam early next summer. Hi Big Kev, they're tops! I also have a little bit of passion for these lures as well. It never amazes me how many subtle variations there are of these lures in countries like Thailand, Singapore & Vietnam. I also see this same kind of lure with life like snake, lizard or fish heads. Do you collect any other of the Asian lures? G'day Ropes.. 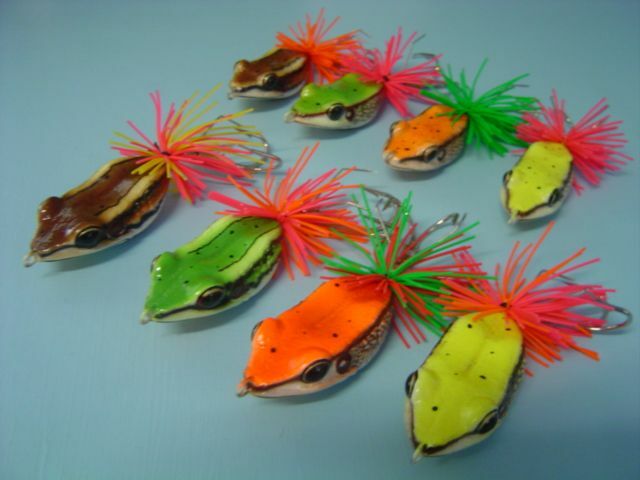 The frogs are the only Asian lures I have.. I've seen the 'Snake Head" lures as well.. Think they are great!! Big Kev..